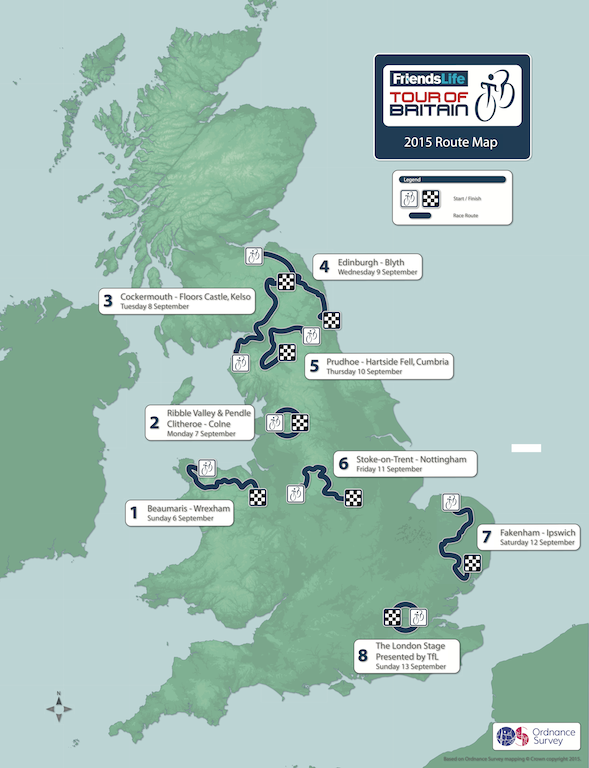 The Tour of Britain starts in Anglesey and ends in London, with a summit finish atop Hartside Pass in Cumbria. Buoyed by what was dubbed the best edition of the modern Tour of Britain to date in 2014, race organisers have opted for more of the same for this year’s edition. From its start on the island on Anglesey on September 6 to a new circuit race finish in London, the 2015 Tour will be one for the rouleurs of the peloton once again. This 2015 edition’s route was unveiled at Wembley Stadium tonight; the Queen stage of the race, which culminates atop Hartside Pass in Cumbria, came on day five. According to Bennett, this year’s route design was inspired by the end-of-season success enjoyed by those who rode the 2014 race. He said: “We were encouraged by Michal Kwiatkowski’s, Bradley Wiggins’s and Ryan Mullen’s performances at last year’s world championships, and Matthias Brändle breaking the Hour Record, all off the back of the race. Last year’s race went no futher north than Liverpool, something this year’s race rectifies. Stage two from Clitheroe and Colne comes in the form of a Belgian-inspired route, as riders twist and turn through the Ribble Valley and Pendle. Scotland welcomes the finish on stage three – which takes place inside the grounds of the 17th century Floors Castle – before Edinburgh hosts the modern Tour for the first time when it hosts the following day’s start. The likely-decisive stage to Harside Pass begins in Prudhoe, near Durham, and runs alongside Hadrian’s Wall before tackling the eight-kilometre long climb, which averages a five per cent gradient and tops out at 575m in height. Stoke-on-Trent and Nottingham return to the race for the first time since 2013 and 2012 respectively, while a new 6.2-kilometre circuit has been designed for the London finale as the race’s traditional route along the Victoria Embankment will not be possible because of the construction of capital’s Cycle Superhighway. However, perhaps the biggest surprise with the route is the lack of a time trial, particularly since the incumbent rainbow jersey wearer Wiggins is expected to compete, and that two of the last four editions have featured one as part of a split stage in London.